Have you seen this tweet? Mayhem erupted in Aldi stores this morning as shoppers battled to get a hold of the supermarket’s Kevin the Carrot soft toy range. There were chaotic scenes with reports of huge queues as people tried to snap up the sought after toys — leading to ‘massive scraps and crushing’. Made famous by Aldi’s Christmas advert, the collection includes Kevin and Katie, their offspring Jasper, Chantenay and a baby….Kevin’s and Katie’s offspring can also be bought in a set for £3.99, along with a small Pascal the Parsnip, which also retails at £3.99. According to a master’s thesis authored at the University of Oldenburg in 2009, certain given names of students can indeed lead to prejudices on the part of teachers. For example, the name Kevin, given to a German child, indicates to German teachers that such a student is prone to behaviour consistent with an intention to gain more attention, as well as lower scholastic performance, and is also indicative of a lower socioeconomic status….Prejudice of this type is understood to be more prevalent amongst teachers in Western Germany. ….The word “Alpha-Kevin” (combination of Alpha male and the given name), as being representative of a particularly intellectually-challenged young person, was, for a time, at the top of the list, which was the subject of a 2015 online poll for the Word of the year (Germany) and, particularly, the youth word of the year. However, it was struck from the list of suggestions on account of being discriminatory to people bearing the name Kevin. I should hope so. After all, a 2012 study showed that many university students are named Kevin, and even some doctoral students. So there! I’ve overlaid the name of my sister, Karen, who was born in 1956, the peak of Karen-mania. I was born in 1958, as Kevin was shooting up the charts, just a few years before it reached its peak in 1963. This shows that my parents, who say they picked our names for no particular reason, were, in fact, just slaves to fashion. 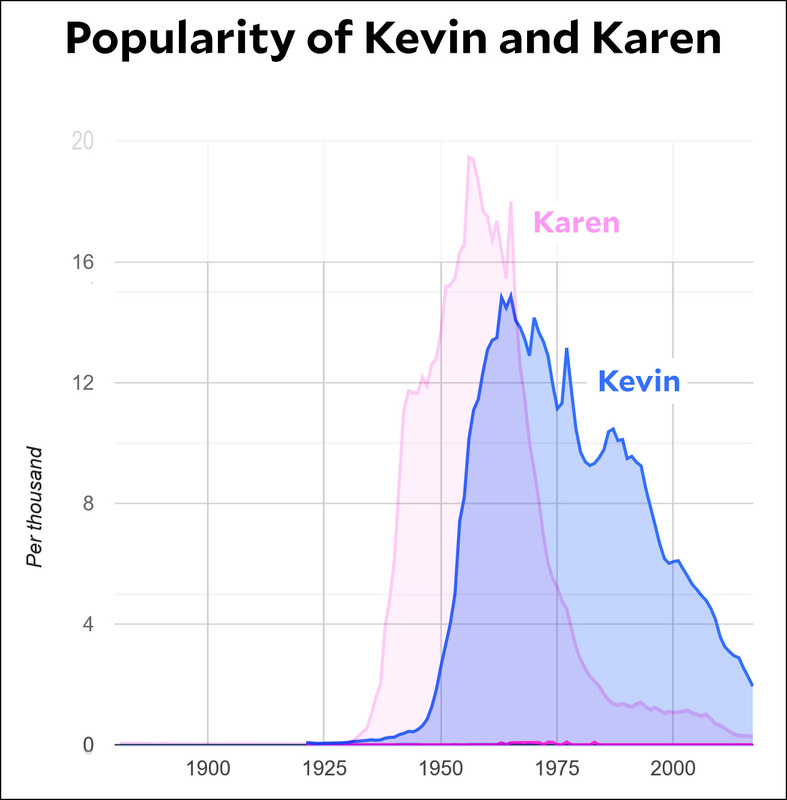 In the spirit of sibling rivalry, I’ll also point out that while Karen may have peaked higher than Kevin (#7 vs. #11), Kevin has shown far more staying power. Karen fell out of the top 100 in 1987, while Kevin managed to gut it out until last year. This also explains the Kevin phenomenon I mentioned. With a peak in 1963, it means there was a bulge in the number of 45-55 year-olds named Kevin starting around five years ago. So not only is the name Kevin more widespread among the middle-aged than it used to be, it’s also a pretty common age for characters in commercials, since it’s when most people reach their peak buying power. This suggests that it will probably fade out in mainstream commercials in about a decade, but will then start to become popular in pharmaceutical ads. In fact, now that I see this, I wonder if advertisers keep track of statistics about baby naming. That is, do they tend to name their middle-aged characters based on popular names 50 years ago, so that current 50-year-olds will feel comfortable when they see them? It wouldn’t surprise me at all. Does anyone in the biz happen to know?